Last weekend was spent in a big house on Big Bear Lake...there was some boating and some card playing and some cocktails and some sleeping and some laughing. The weather was perfect. Warm and sunny during the day; chilly at night. I've missed my mountains and while these ones differ from the Flat Irons, they are just as beautiful. Saturday involved the Chicken Dance and a liter of beer...or maybe that should say a liter of beer followed by the Chicken Dance. And nope, that wasn't just for me. I've learned my limit (I never said I was a fast learner) and shared this with others. 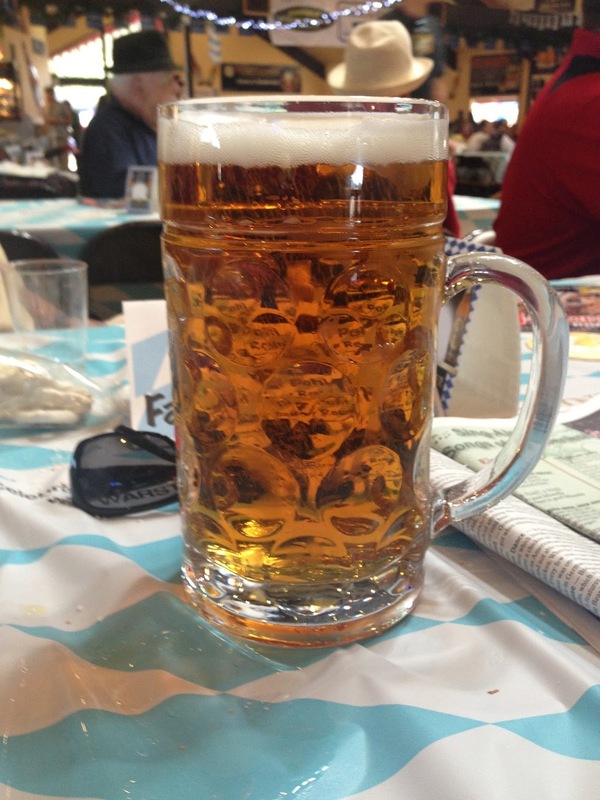 Nothing beats a Spaten Oktoberfest beer, though...especially when it's ice cold and poured by an Italian named Sal. I missed going to an OktoberFest last year and to be there on opening day seemed fitting. The band was...loud. The food was...hot. The liederhosen were...everywhere. Monday morning came early and with it a boat load of problems. A big boat load. Every employee was frustrated and it was just an ugly morning (and afternoon) but it did settle down. I really like what I do, which helps...but Monday morning was rough. I finally just called it quits and made a beef stroganoff (with roasted short ribs as the beef part of it) and it felt so good to actually feed my family real food for a change. They've taken the brunt of my working so much with throw together meals...no one has gone hungry but still. I've worked a few hours already this morning and am going to head to the university to hear that guy that I like so much's choir sing in chapel. I've got a lunch date with girlfriends and then a PILE of paperwork to sort through, but I think today will be an at home day as much as possible. The laundry is out of control and you could seriously eat off my floors...and find yourself full. Ick.